SSDP Mentors is the Students for Sensible Drug Policy Alumni Association Mentoring Program. By connecting current SSDP students with those who have graduated, we hope that students can be better prepared for life after graduation, and alumni can stay better connected to student drug policy activism, while providing mentorship and guidance to their younger peers. Currently in pilot phase during the 2016-17 academic year, SSDP Mentors is a way for students and alumni to develop meaningful relationships that further the cause of sensible drug policy reform while aiding in students’ professional development. The goal of the program is to keep alumni connected to the current work that SSDP students are doing while simultaneously giving students an additional resource to utilize as they fight to end the drug war in their communities. Sign up to be a mentor. Sign up to be a mentee. Currently in pilot phase, SSDP Mentors is the SSDP Alumni Association Mentoring Program, a way for students and alumni to develop meaningful relationships that further the cause of sensible drug policy reform while aiding in students’ professional development. The goal of the program is to keep alumni connected to the current work that SSDP students are doing while simultaneously giving students an additional resource to utilize as they fight to end the drug war in their communities. Members in good standing of the SSDP Alumni Association. Members will have received a welcome email from stacia@ssdp.org when their initial enrollment was completed. If a member falls out of good standing (almost always due to lapsing Sensible Society donations), they will receive emails from SSDP staff members. If you’re still unsure about your membership status, contact stacia@ssdp.org. Any student who is currently a member of an SSDP chapter. Current chapter involvement will be validated by the appropriate regional Outreach Coordinator. When can I expect to hear back once I’ve signed up? Mentees should expect to be matched with a mentor within one month of signing up. Since we currently have more mentors than mentees signed up, mentors may not hear back within this same time frame. Be sure to add stacia@ssdp.org to your contact list so that SSDP Mentors correspondence doesn’t get stuck in your spam folder. Contact Stacia Cosner if you’re curious about your eligibility status. How long is the duration of mentor/mentee relationships? It’s our hope that these relationships will last (in some form or another) a lifetime! However, a formal mentor/mentee relationship may be terminated at any time if either person wishes to do so. How much time should I plan to commit? This will vary greatly depending on the individuals involved, work and school schedules, etc. But it’s expected that you spend at least one hour per month communicating with your mentor/mentee. How often can I contact my mentor? Your mentor is likely a working professional and may not be available all the time to answer your questions. It will be up to you and your mentor to develop a working relationship with realistic expectations for response times to any questions you may have, and what the best methods of contact will be (email, text message, call, etc.). This may change over time depending on the nature of the relationship. How are mentor/mentee pairs determined? During the matching process, we take a number of factors into consideration, including: geographic proximity, school(s) attended, employment industry, drug policy specific interests, and non-drug policy specific interests. We will do our very best to consider as many factors as possible when determining matches, but cannot guarantee that your mentor/mentee will be a match for any or all of those mentioned. What do we do once we’ve been matched? If you had 3 months with no responsibilities and didn’t have to worry about money, where would you go? What would you do? 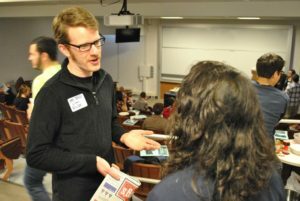 How did you get involved with SSDP? What’s your favorite SSDP memory/story? What are/were your biggest successes and failures as a student SSDPer? Tell me about your best SSDP conference experiences. How have you incorporated your SSDP experiences into your adult life post-graduation? How did you decide to major in X? What’s it like working for/studying X? What’s the most exciting project you’ve ever worked on? What’s the best part about being a student at X? What’s the coolest place you’ve ever been? Tell me about the most interesting class you’ve ever taken. Tell me a story about X. What are you most looking forward to in a post-prohibition world? What do you want to accomplish with your involvement with SSDP? What are your ideas in helping reform drug policy? Do you see yourself working in drug policy after college? Why is drug policy reform important to you? What skills have you learned through your involvement in SSDP? How can you incorporate what you’ve learned through SSDP into your career goals? What do you imagine a prohibition-free world looking like?